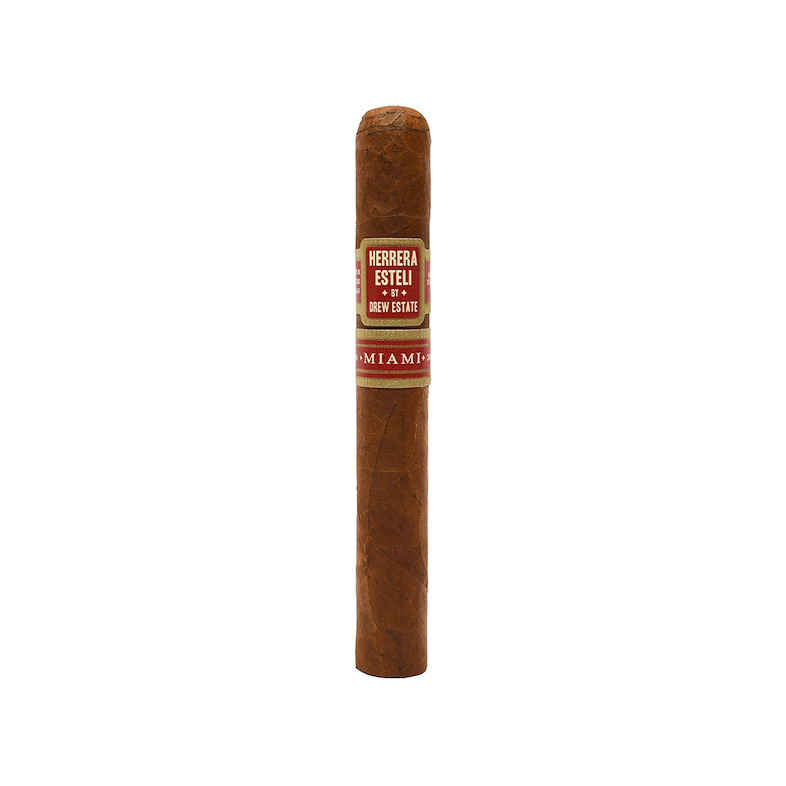 Friday, July 22, 2016 — Miami, FL – Drew Estate announced today the release of Herrera Estelí Miami as a line extension to the Herrera Estelí Brand. The new cigar will be displayed in Drew Estate’s booth (Booth #2403) at the IPCPR Convention and Tradeshow held July 24 – 28, 2016 in Las Vegas, Nevada. Willy Herrera known for his signature Cubanesque blending style was recruited to join Drew Estate in 2011, after running the El Titan de Bronze factory since the late 90s. The factory is known for being one of the few remaining hand made cigar factories in the United States and employs only Level 9 rollers from Cuba who continue to manufacture cigars in traditional Cuban style, including tubing the filler and finishing with a triple cap. Willy spent the first 3 years at Drew Estate, predominantly in Estelí, Nicaragua adapting to working at La Gran Fabrica Drew Estate, a factory with access to some of the most innovative and diverse black tobaccos in the world. In 2013, Drew Estate released the Herrera Estelí Brand, a medium bodied, spicy, cubanesque cigar, and followed up in 2014 the release of Herrera Estelí Norteño, a full-bodied maduro, as his sophomore release. The new Herrera Estelí Miami debuts in a 5 ¾ x 48 corona vitola packaged in 10 count boxes with an MSRP of $130.00 per box. The blend features an Ecuadorian Habano Oscuro Wrapper, Ecuadorian Sumatra Binder, and Dominican and Nicaraguan Fillers. The unique attribute of the new release is that it is produced at El Titan de Bronze Factory on Calle Ocho in Little Havana, Miami, Florida. In addition to the new Herrera Estelí Miami, the Herrera Estelí line will offer new packaging configurations including a Display Tray and refill bundles in the core Herrera Esteli Vitolas including the Herrera Esteli Toro, Piramide Fino, Lonsdale, Robusto, and Short Corona. Founded in New York City in 1996, Drew Estate has become one of the fastest growing tobacco companies in the world. Under their mantra “The Rebirth of Cigars”TM, Drew Estate has led the “Boutique Cigar” movement by innovating new elements to the tobacco industry with their unique tobaccos and blending styles that have attracted new and traditional cigar enthusiasts. In their Gran Fabrica Drew Estate, the Nicaraguan headquarters, Drew Estate produces a variety of brands such as ACID, Herrera Estelí, Herrera Estelí Norteño, Kentucky Fired Cured, Liga Privada, MUWAT, Natural by Drew Estate, Nica Rustica, Pappy Van Winkle Barrel Fermented Cigars, Tabak Especial, Undercrown, and Java by Drew Estate. HE + ETB must equal goodness.